via 2019 Welcome Home Program for Kentucky Home Buyers. What is the Welcome Home Program? The Welcome Home Program (WHP) offers grants to fund reasonable down payments and closing costs incurred in conjunction with the acquisition or construction of owner-occupied housing by low- and moderate-income homebuyers. The grants are limited to $5,000 per homebuyer and Members are subject to an aggregate limit of $200,000 per offering. All funds are reserved for specific homebuyers purchasing specific homes and cannot be transferred to other homebuyers or to other homes. Welcome Home funds will be available for reservation on a first-come, first-served basis beginning at 8:00 AM ET on March 1, 2018, and will remain available until all funds have been reserved. Who Can Use the WHP? The FHLB has established a set-aside of Affordable Housing Program (AHP) funds to help create homeownership. These funds are available to Members as grants to assist their mortgage loan applicants in the home buying process. This is our most widely used program, ideally suited to the needs of community lenders and their customers. The total income for all occupants must be at or below 80 percent of the Mortgage Revenue Bond (MRB) limit for the county and state where the property is located. The FHLB has an Income and Affordability Workbook to assist in determining household income eligibility. Homebuyers must contribute at least $500 of their own funds towards down payment and/or closing costs. WHP applicants do not have to be first-time homebuyers. However, all first-time homebuyers are required to complete a homeownership counseling program. WHP grant funds are intended only for homebuyers who qualify for the first mortgage based on their own merit. Co-signors and co-borrowers are not allowed unless they will occupy the home as their primary residence and their incomes are included in determining eligibility. WHP grant funds may be used in conjunction with other local, state and federal funding sources and with the FHLB Cincinnati’s Community Investment Cash Advance Programs. The Member who reserves the WHP funds must originate the first loan, but the loan may close in the name of a third party. The interest rate for the first mortgage may not exceed 7.50 percent. The interest rate for the second mortgage may not exceed 11.00 percent. Only second mortgages provided by formal organizations, community development financial institutions, housing finance agencies, non-profit organizations, etc. are acceptable. All eligible property assisted with WHP funds is subject to a five-year retention mechanism (Retention Agreement), which may require the household to repay all, or a portion, of the subsidy, if the home is sold or refinanced within five years from the closing of the transaction. Homebuyers must apply with one of our Member institutions. Click here to search our Member Directory. Members may reserve funds via the Welcome Home Program link through the FHLB’s Members Only portal by submitting an online Reservation Request with supporting documentation. Instructions for accessing Members Only may be found here. The FHLB will perform a preliminary review of the Reservation Request and the documentation submitted to determine eligibility of the homebuyer, availability of funds in the program, and availability of funds for the Member. If any of the information is incomplete, additional documentation or information may be required. Note: The Reservation Request will be denied upon receipt if a fully executed loan application is not included. Written notification will be provided to the Member as to the homebuyer’s eligibility. Submission of a Reservation Request does not constitute an approval of funds. Funds are reserved only upon written notification of approval from the FHLB. Please allow four weeks for the FHLB to review the Reservation Request and supporting documentation. Welcome Home funds will only be disbursed after closing. The FHLB has some general guidance and specific instructions that Members and Closing Agents should use in closing mortgages using Welcome Home funds. Funds will be disbursed only to the extent they are required to fill the gap for down payment, closing costs, and counseling fees. Members may submit a Request for Payment of Reserved Funding with supporting documentation via the Welcome Home Program link through the FHLB’s Members Only portal. Submission of a Request for Payment of Reserved Funding is not an approval of funds disbursement. Once the Request for Payment of Reserved Funding has been reviewed and approved, funds will be disbursed to the Member. In the event the FHLB determines that funds were used for an ineligible expense, the grant will be reduced by the amount of the ineligible expense unless the household brings adequate funds to the closing to cover the amount of the ineligible expense. Under no circumstances will cash back to the homebuyer be permitted. Please allow four to six weeks for the FHLB to review the Request for Payment of Reserved Funding and supporting documentation. Income limits are obtained from the state housing finance agency for each state. Use the 80% limits for the Welcome Home Program. Use the 100% limits for the Disaster Reconstruction Program. 1. Do Mortgage Interest Rates Change Daily? Just like the gas prices at the pump, mortgage rates can change daily or throughout the day. Typically mortgage rates are published at 10-11 am daily by most lenders and you can lock up through the close of business which is usually around 6-7 PM. Mortgage rates can change up or down throughout the day based on various financial, economics, and geopolitical news in the US Financial markets and World markets. Generally speaking, good economic news is bad for rates and vice versa, bad economic news is good for mortgage rates. The good news is this: Once you find a home and get it under contract, you can lock your mortgage loan rate. Typically it takes about 30-45 days to close a mortgage loan in Kentucky, so the typical lock is for 30-60 days. If rates get better you may be able to negotiate a better rate with your lender, but they usually have to improve by at least 25 basis points (.25) to do that. Not all lenders offer this option. The longer you lock the loan, the greater the costs. It is usually free to lock in a loan for up to 90 days without having to pay a fee. What a lot of lenders are experiencing now is that some loans don’t close on time for various reasons. You can always extend the lock on the loan but it will costs you usually .125 basis points to do so. If you let the lock expire on the loan, then you have to take worse case pricing on that day when you go to relock. It is usually best to extend the lock on your loan. 2. What kind of Credit Score Do I need to qualify? When applying for a mortgage loan, lenders will pull what they call a “tri-merge” credit report which will show three different fico scores from Transunion, Equifax, and Experian. The lenders will throw out the high and low score and take the “middle score” For example, if you had a 614, 610, and 629 score from the three main credit bureaus, your qualifying score would be 614. Most lenders will want at least two scores. So if you only have one score, you may not qualify. Lenders will have to pull their own credit report and scores so if you had it ran somewhere else or saw it on a website or credit card you may own, it will not matter to the lender, because they have to use their own credit report and scores. Most lenders will pull your credit report for free nowadays so this should not be a big deal as long as your scores are high enough. The Secondary Market of Mortgage loans offered by FHA, VA, USDA, Fannie Mae, and KHC all have their minimum fico score requirements and lenders will create overlays in addition to what the Government agencies will accept, so even if on paper FHA says they will go down to 580 or 500 in some cases on fico scores, very few lenders will go below the 620 threshold. If you have low fico scores it may make sense to check around with different lenders to see what their minimum fico scores are for loans. As you can see, 620 is the minimum score with most lenders for a FHA, VA, or Fannie Mae loan, and 640 is required for the no down payment programs offered by USDA for Kentucky for First Time Home Buyers wanting to go no money down. 3. What are the down payment requirements? FHA will allow a home buyer to purchase a house with as little as 3.5% down. If your credit scores are low, say 680 and below, a lot of times it makes sense to go FHA because everyone pays the same mortgage insurance premiums no matter what your score is, and the down payment can be gifted to you. Meaning you really don’t have to have any skin into the game when it comes to down payment. They even allow down payment assistance through eligible parties (government grants or non-profits). Lastly, FHA will allow for higher debt to income ratios with sometimes getting loan pre-approvals up to 55% of your total gross monthly income. Fannie Mae requires just 3% down with their new Home Possible Program, but if you use their traditional mortgage loan, then 5% is the Fannie Mae Standard. Fannie Mae will o down to a 620 score, but if your scores are below 680, I would look seriously at the FHA loan program because Fannie Mae has steep increases to the interest rate and the mortgage insurance premiums if your scores are low. A couple of good things about Fannie Mae is that you can buy a larger priced home and have a large loan amount due to FHA only allowing most Kentucky Home Buyers a maximum mortgage loan amount of $275-to $287k price range while Fannie Mae will go up to Conforming loan limits of $410k. Lastly when it comes to mortgage insurance, FHA mortgage insurance premiums are for life of loan while Fannie Mae mortgage insurance premiums drop off when you develop 80% equity position in your house. But as a tell most people, nobody has a loan for 30 years, and the average mortgage is either refinanced or home sold within the first 5-7 years. Kentucky First Time Home Buyers typically use KHC for their down payment assistance. KHC currently offers $4500 to $6000 for down payment assistance and sometimes throughout the year they will offer low mortgage rates on their mortgage revenue bond program. The down payment assistance usually never runs out because you have to pay it back in the form of a second mortgage. It helps a lot of home buyers that want to buy in urban areas that cannot utilizer the USDA program in rural areas. Most of the time the first mortgage is a FHA loan tied with the 2nd mortgage fore down payment assistance. All KHC programs require a 620 score and rates are locked for 45 days. Max income limits are usually set around $112k for a household with the max loan being $283,000 currently. 4. What if I have had a bankruptcy or foreclosure in the past? FHA and VA are the easiest on previous bankruptcies. 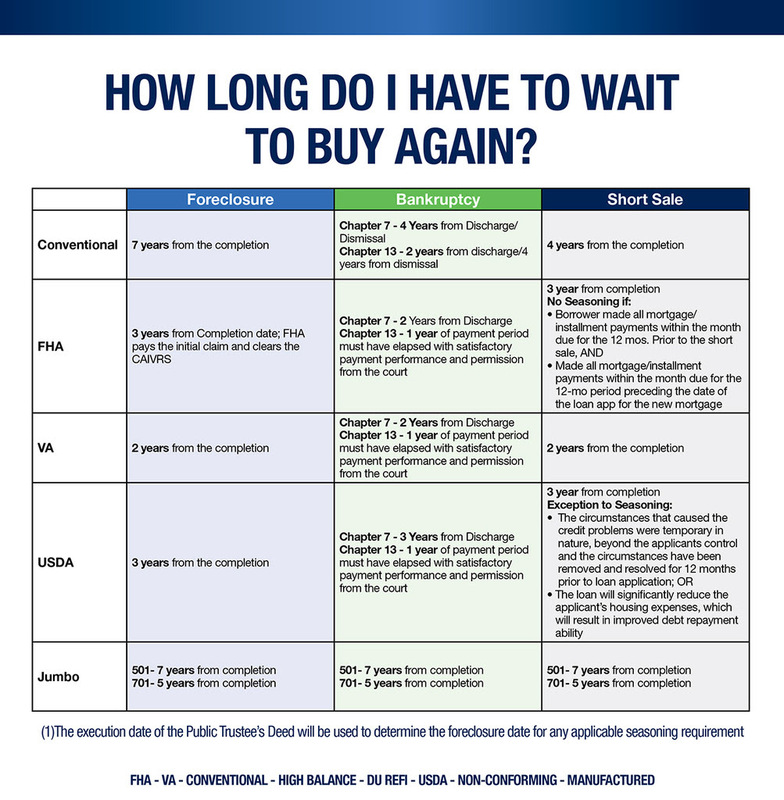 FHA and VA both require 2 years removed from the discharge date on a Chapter 7. If you are in the middle of a Chapter 13, FHA will allow for financing with a 12 month clean history payment to the Chapter 13 courts, and with trustee permission. VA requires 2 years removed from a foreclosure (sheriff sale date of home) and FHA requires 3 years. USDA requires 3 years removed from both a foreclosure and bankruptcy, but on the foreclosure they do not go off the sale date. This may save you a little time if you had a previous foreclosure. If you have questions about qualifying as first time home buyer in Kentucky, please call, text, email or fill out free prequalification below for your next mortgage loan pre-approval. What kind of credit score do I need to qualify for a Kentucky Mortgage Loan? Credit scores play an important part in getting approved for a Kentucky Mortgage loan. Your credit scores consist of 3 digits and range anywhere from the low-end of 300 to a high score of 800 range on the top-end. Most borrowers are going to fall in the 500, 600, 700 range, with a few in the 300 and 800 ranges. The higher the score the better it is for chances of getting approved for a Kentucky Mortgage loan and getting better terms as far as rates, closing costs and mortgage insurance. Vantage Score ranges vary depending on the version the bureau is using. Earlier versions offer a range of 501 to 990 whereas a newer version would range from 300 to 850.
Credit bureaus will often provide scores within several different scoring models, which can cause you to have two different scores issued by a single bureau at one time. This can be confusing if you do not understand where the score is coming from, who it is being provided to, and why. If you go to get a credit card and then go to buy a car, those two places of business from whom you are seeking credit will likely be looking at different scoring models and therefore would each likely be looking at a different score by which they would determine your creditworthiness. As of right now, January 2019, there are no funds available for the $10,000 Grant for Kentucky Home Buyers. However, they’re current down payment assistance programs available now up to $6000 for Kentucky Homebuyers in 2019 to purchase a home with 100% financing no down payment, this is subject to change throughout the year so check back periodically. Answer. Most lenders will wants a middle credit score of 620 for KY First Time Home Buyers looking to go no money down. The two most used no money down home loans in Kentucky being USDA Rural Housing and KHC with their down payment assistance will want a 620 middle score on their programs. ∘ Does it costs anything to get pre-approved for a mortgage loan? Answer: Most lenders will not charge you a fee to get pre-approved, but some lenders may want you to pay for the credit report fee upfront. Typically costs for a tri-merge credit report for a single borrower runs about $50 or less. Maybe higher if more borrowers are included on the loan application. ∘ How long does it take to get approved for a mortgage loan in Kentucky? Answer: Typically if you have all your income and asset documents together and submit to the lender, they typically can get you a pre-approval through the Automated Underwriting Systems within 24 hours. They will review credit, income and assets and run it through the different AUS (Automated Underwriting Systems) for the template for your loan pre-approval. Fannie Mae uses DU, or Desktop Underwriting, FHA and VA also use DU, and USDA uses a automated system called GUS. GUS stands for the Guaranteed Underwriting System. ∘ Are there any special programs in Kentucky that help with down payment or no money down loans for KY First Time Home Buyers? ∘ When can I lock in my interest rate to protect it from going up when I buy my first home? Answer: You typically can lock in your mortgage rate and protect it from going up once you have a home picked-out and under contract. You can usually lock in your mortgage rate for free for 90 days, and if you need more time, you can extend the lock in rate for a fee to the lender in case the home buying process is taking a longer time. The longer the term you lock the rate in the future, the higher the costs because the lender is taking a risk on rates in the future. Interest rates are kinda like gas prices, they change daily, and the general trend is that they have been going up since the Presidential election in November 2016. ∘ How much money do I need to pay to close the loan? Answer: Depending on which loan program you choose, the outlay to close the loan can vary. Typically you will need to budget for the following to buy a home: Good faith deposit, usually less than $500 which holds the home for you while you close the loan. You get this back at closing; Appraisal fee is required to be paid to lender before closing. Typical costs run around $400-$450 for an appraisal fee; home inspection fees. Even though the lender’s programs don’t require a home inspection, a lot of buyers do get one done. The costs for a home inspection runs around $300-$400. Lastly, termite report. They are very cheap, usually $50 or less, and VA requires one on their loan programs. FHA, KHC, USDAS, Fannie Mae does not require a termite report, but most borrowers get one done. There are also lender costs for title insurance, title exam, closing fee, and underwriting fees that will be incurred at closing too. You can negotiated the seller to pay for these fees in the contract, or sometimes the lender can pay for this with a lender credit. The lender has to issue a breakdown of the fees you will incur on your loan pre-approval. How long is my pre-approval good for on a Kentucky Mortgage Loan? Answer: Most lenders will honor your loan pre-approval for 60 days. After that, they will have to re-run your credit report and ask for updated pay stubs, bank statements, to make sure your credit quality and income and assets has not changed from the initial loan pre-approval. How much money do I have to make to qualify for a mortgage loan in Kentucky? Answer: The general rule for most FHA, VA, KHC, USDA and Fannie MAe loans is that we run your loan application through the Automated Underwriting systems, and it will tell us your max loan qualifying ratios. There are two ratios that matter when you qualify for a mortgage loan. The front-end ratio, is the new house payment divided by your gross monthly income. The back-end ratio, is the new house payment added to your current monthly bills on the credit report, to include child support obligations and 401k loans. Car insurance, cell phone bills, utilities bills does not factor into your qualifying rations. If the loan gets a refer on the initial desktop underwriting findings, then most programs will default to a front end ratio of 31% and a back-end ratio of 43% for most government agency loans that get a refer. You then take the lowest payment to qualify based on the front-end and back-end ratio. So for example, let’s say you make $3000 a month and you have $400 in monthly bills you pay on the credit report. What would be your maximum qualifying house payment for a new loan? Take the $3000 x .43%= $1290 maximum back-end ratio house payment. So take the $1290-$400= $890 max house payment you qualify for on the back-end ratio. Then take the $3000 x .31%=$930 maximum qualifying house payment on front-end ratio. So now your know! The max house payment you would qualify would be the $890, because it is the lowest payment of the two ratios. There are basically 5 popular programs that Kentucky Home buyers use to purchase their first home. • Closing costs will vary on which rate you choose and the lender. Typically the higher the rate, the lesser closing costs due to the lender giving you a lender credit back at closing for over par pricing. Also, called a no-closing costs option. You have to weigh the pros and cons to see if it makes sense to forgo the lower rate and lower monthly payment for the higher rate and less closing costs. Fico scores needed start at 620, but most conventional lenders will want a higher score to qualify for the 3-5% minimum down payment requirements Most buyers using this loan have high credit scores (over 720) and at least 5% down. The rates are a little higher compared to FHA, VA, or USDA loan but the mortgage insurance is not for life of loan and can be rolled off when you reach 80% equity position in home. Conventional loans require 4-7 years removed from Bankruptcy and foreclosure. FHa loans are good for home buyers with lower credit scores and no much down, or with down payment assistance grants. FHA will allow for grants, gifts, for their 3.5% minimum investment and will go down to a 580 credit score. 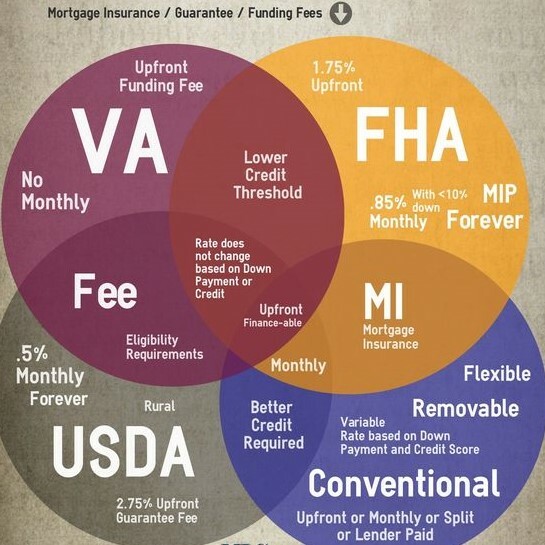 The current mortgage insurance requirements are kinda steep when compared to USDA, VA , but the rates are usually good so it can counteracts the high mi premiums. As I tell borrowers, you will not have the loan for 30 years, so don’t worry too much about the mi premiums. THe mi premiums are for life of loan like USDA. FHA requires 2 years removed from bankruptcy and 3 years removed from foreclosure. Maximum FHA loan limits in Kentucky are set around $285,000 and below. VA loans are for veterans and active duty military personnel. The loan requires no down payment and no monthly mi premiums, saving you on the monthly payment. It does have an funding fee like USDA, but it is higher starting at 2% for first time use, and 3% for second time use. The funding fee is financed into the loan, so it is not something you have to pay upfront out of pocket. 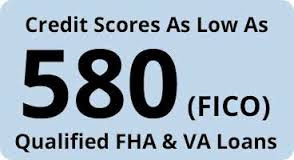 Most VA lenders I work with will want a 620 credit score though I am setup with lenders that will go down to a 560 credit score if I can get it approved. VA requires 2 years removed from bankruptcy or foreclosure. This type of loan is administered by KHC in the state of Kentucky. They typically have $4500 to $6000 down payment assistance year around, that is in the form of a second mortgage that you pay back over 10 years. Sometimes they will come to market with other down payment assistance and lower market rates to benefit lower income households with not a lot of money for down payment. KHC offers FHA, VA, USDA, and Conventional loans with their minimum credit scores being set at 620 for all programs. The conventional loan requirements at KHC requires 660 credit score. Effective with new reservations as of Monday, January , 2019, properties located in one of the counties considered Middle Appalachia or Lower Mississippi Delta will have access to a $1,500 closing cost grant. Borrowers must be under the specific income limits per the Duty to Serve (DTS) program. KHC recognizes that down payments, closing costs, and prepaids are stumbling blocks for many potential home buyers. Here are several loan programs to help. Your KHC-approved lender can help you apply for the program that meets your need. Zero percent interest rate for first-time home buyers. A non-repayalbe second mortgage for $10,000. Home purchase must be located in Christian county. No other counties will be eligible. New construction properties are not allowed. Property has to have been previously occupied. Applicants must meet Secondary Market Income and Purchase Price Limit. Purchase price up to $301,294 with Secondary Market. Repayable over a ten-year term at 5.50 percent. Borrowers must meet Affordable DAP income limits. No liquid asset review and no limit on borrower reserves. The max debt to income ratios are set at 40% an 50% respectively. For more information or assistance, please contact the Housing & Community Investment Department at (513) 852- 7680 or toll-free (888) 345-2246 or email us at welcomehome@fhlbcin.com. For assistance with Members Only, please contact the Service Desk at 800-781-3090.